The challenges that we face when implementing a Global HR and Payroll System (Global HRMS) are significant, but not insurmountable. A Global HR and Payroll System is defined as an HRMS that supports the labor and tax laws of every country and industry. And since every country has its own labor and tax laws, the said global HR and Payroll system must comply with these laws. 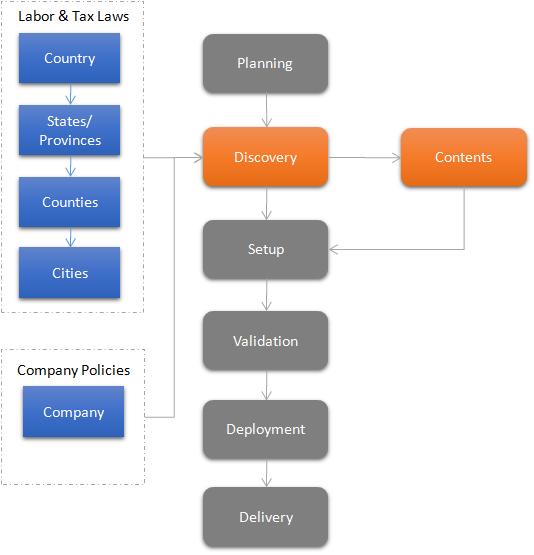 The technology to support these laws is available in most enterprise HRMS systems provided you are ready to define these laws to the system, meaning to do the setup of every policy and/or law applicable to the said country, state, province, county, and city. The challenge at hand is not the technology, but the Contents. The technology (HRMS) is the Container, the Laws and Policies relevant to each country, state/province, county, city, and client are the Contents that must fill the Container is the Technology, the HRMS. The Contents is the challenge, discovering, setting up, and validating the Contents is the main challenge. 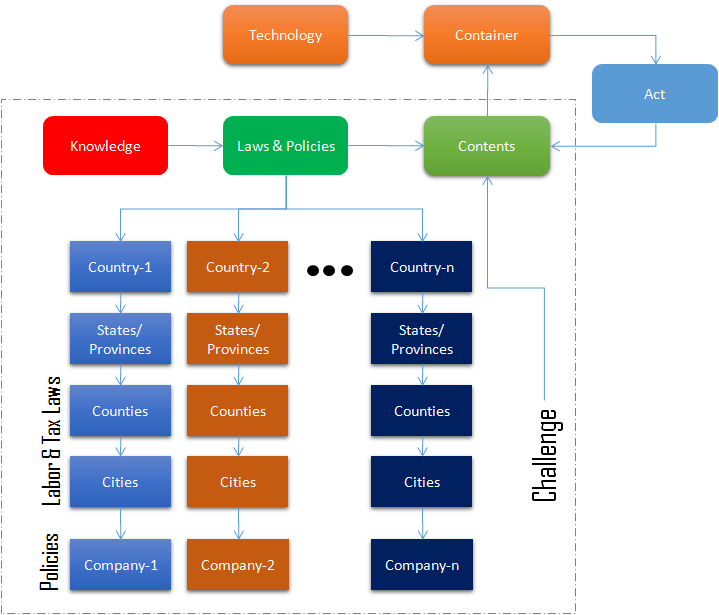 Figure-1 depicts the conceptual view of the Global HRM Challenge Framework. Figure-1: Conceptual View of the Global HRMS Challenge Framework. Example, if you have a Text Editor or a Word Processor, that is only a container, a tool, that allows you to create, edit, format, and print text. But without text you do not have anything. So the Text Editor is only an enabler. Similarly, for HRMS (HR and Payroll System), it is a tool, but without contents, it is not useful. Thus, the challenge for a Global HR and Payroll System (Global HRMS) is the Contents. How to discover, capture, setup, and constantly update the Contents? As previously stated, an HRMS (HR and Payroll System) is only a container, a technology tool and an enabler. Yes, such a tool/technology should be flexible with an architecture and functionality that is designed to enable multiple setups in support of any type of labor and tax law and company policy. Yet, setup flexibility within the system, does not overcome the challenge of having an HRMS implemented globally. The challenge is the contents, the knowledge that is required to derive all the labor and tax laws and policies for each country, state, county, province, city, and company by industry. A Global HRMS comes with no contents, or minimal contents for handful of countries. And those that have the full contents built-in, are designed for one or two specific countries. There country-specific HRMS are country specific and not Global HRMS. Content is the driver as it is used to setup the system during the implementation of the said Global HRMS. Figure-2 depicts when Contents is captured during the implementation of the system. 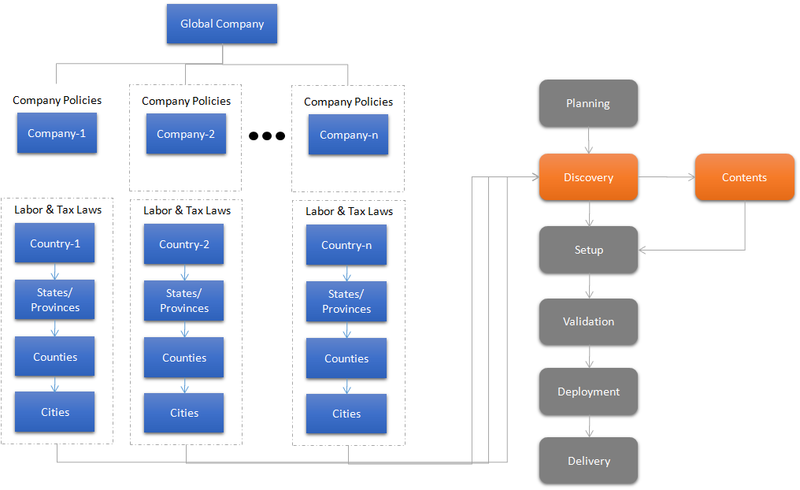 When implementing a Global HRMS for specific company and for specific country, the Content is captured during the Discovery phase of the Implementation Cycle. 70% to 80% of the implementation time is spent on capturing contents, setting up the contents, and validating the contents after the setup. Assume that we are implementing a Global HRMS (Global HR and Payroll System) for a Global Company that has offices/subsidiaries in ten (10) different countries. The company then must comply with the Labor and Tax Laws of each country and need to implement the HR and Payroll policies of each of its subsidiaries in each country. The implementation of HRMS needs to be planned for each company/subsidiary by country. And in each implementation, we need to discover and capture the contents of each company/subsidiary that address the country labor and tax laws and the company/subsidiary policies. And if we have to spend 70% to 80% of the implementation time on discovering the contents, you can start to see the challenge in discovering, setting up, and validating the contents. During any of these implementations, if the contents is not discovered correctly, then the implementation may fail, and thus the implementation needs to be repeated which increases the cost of the implementation and many delays in the delivery of the system. The discovery of the contents is challenging, however not insurmountable. A Global HRMS (HR and Payroll System) is an enterprise system that is designed and implemented using a flexible architecture that supports a generic setup functionality that can be used in the implementation of the system in any country and any company and in any industry. It provides the tools and flexibility to setup any contents irrelevant of the country or company or industry. However, such flexibility comes at a price, and that price is that the system comes with no Contents. Contents need to be discovered and setup in the system using specific rules. Country-Specific HRMS, is designed and developed for specific country and sometimes for specific industry. Such a system comes with a contents that is already built in the system. The advantage of Country-Specific HRMS is that it comes with the contents already built within the system, so the implementation overhead is minimal. However Country-Specific HRMS, cannot be used for Global Companies as it does not support various countries. Figure-4 shows the Advantages & Disadvantages of Global HRMS versus Country-Specific HRMS. The primary advantage of Country-Specific HRMS is that it comes with Contents built-in, which makes the implementation easy, less costly, and timely. In order to overcome the Contents Challenge to the implementation of a Global HRMS, we need to add the main advantage of Country-Specific HRMS, to the Global HRMS, and that advantage is Built-In Contents. Now, if we can have a Global HRMS with all its flexibility in support of many countries and industries, and on the top of that have a Built-In Baseline Contents in support of each Country’s Labor and Tax Laws, then the Global HRMS will deliver on its promises and provide a flexible Global HR and Payroll Solution that is optimal, agile, and cost effective. If we are to add Built-In Contents to a Global HRMS, then this Contents needs to be by Country, and that is a major challenge and requires a cost effective solution that addresses all aspects of Built-In Contents Management and Change Control. Labor and Tax Laws and Company Policies are not static. They tend to change periodically, and this change needs to be managed. Other challenges of Managing Built-In Contents include the Sources of Contents, and the Format of the Contents, and the Restructuring of the Contents Format to make it ready to be captured into the system setup. Interact HRMS is a Global HRMS solution that encompasses more than 70 seamlessly integrated application that covers Foundation, Core HR, Time and Leave Management, Payroll Management, and Talent Management. Interact HRMS is currently implemented and deployed, in many countries. And given 2Interact experience in implementing, Interact HRMS in various countries, we do recognize the challenges of discovery and setting up Contents by country and industry. Our strategy and solution is to have Built-In Contents for each country within Interact HRMS. What this means, is that when the system is installed and the user creates the Company/Employer and define the country where the Company/Employer operates, the system will automatically apply and activate the system setup that support Company/Employer Country’s Labor and Tax Laws. Contents change control and management will be conducted through Contents Web Service that will connect to the systems where Interact HRMS is installed and update the Contents whenever specific Labor and Tax Laws have changed. With this solution, Interact HRMS will remain a Global HR and Payroll system while having Built-Contents that streamlines the implementation of a Global HRMS and makes it less costly to implement, deploy, and maintain and manage.